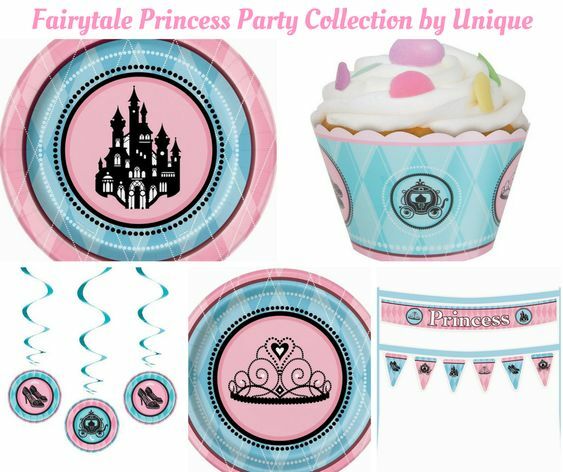 This high chair cover & skirt is sure to bring your daughters birthday party up to the next level! This cover & skirt has all the extras on it! 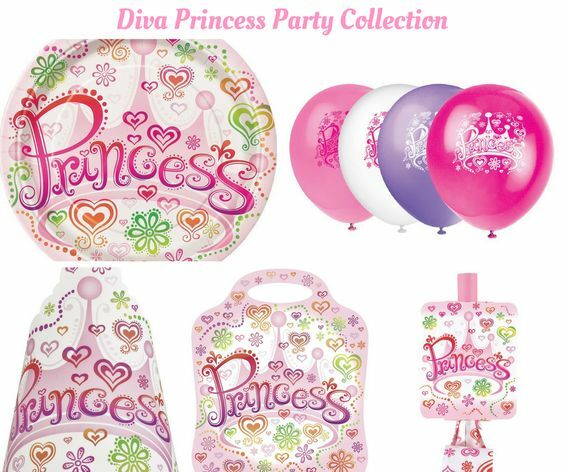 The cover is made with either hot pink or light pink satin sparkle fabric with a gold sparkle princess crown in the center of it! 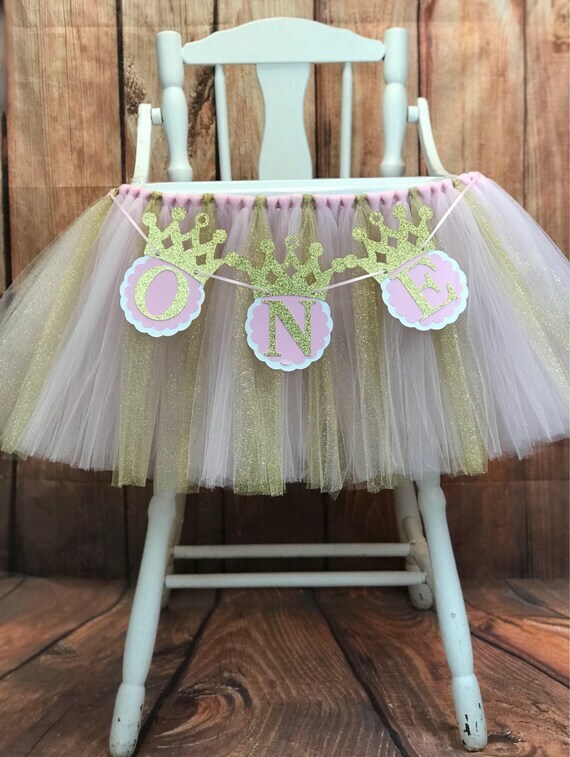 The tulle skirt is really full and fluffy and made with either hot pink or light pink tulle and gold glitter tulle with two gold bows to top it off! 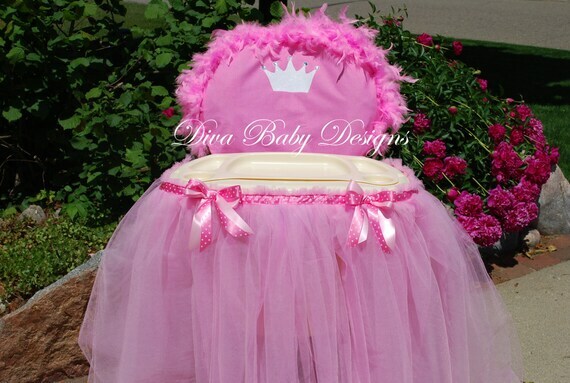 This high chair cover & skirt is sure to bring your daughters birthday party up to the next level! This cover & skirt has all the extras on it! 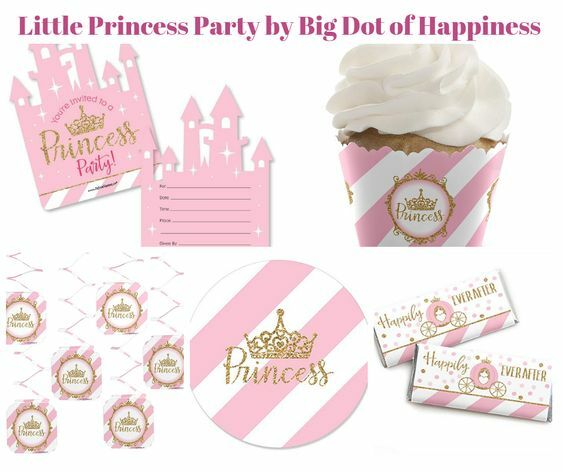 the cover is made with pink polka dot fabric with a big white sparkle crown on it with rhinestones at each point! It has pink feathers across the top! The tulle skirt is very long & full and is made with tons & tons of tulle! It has a pink polka dot ribbon across the top with big bow in the center. If you would like this set to be made in different colors just contact me! 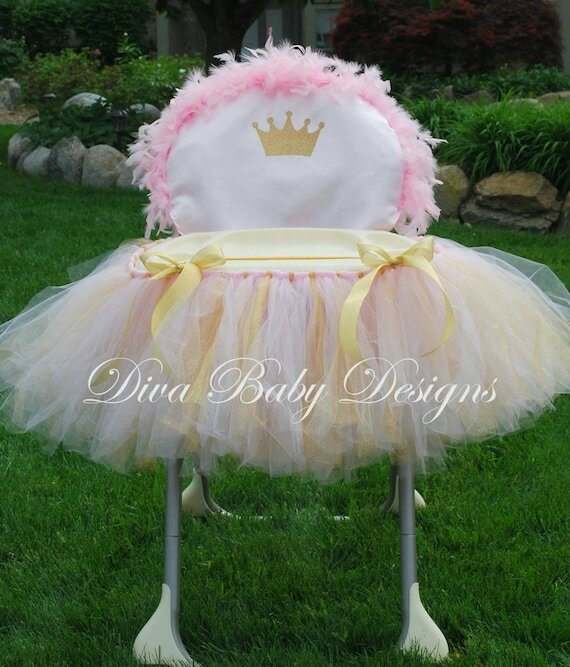 This high chair cover is sure to bring your daughters birthday party up to the next level! This cover has all the extras on it! 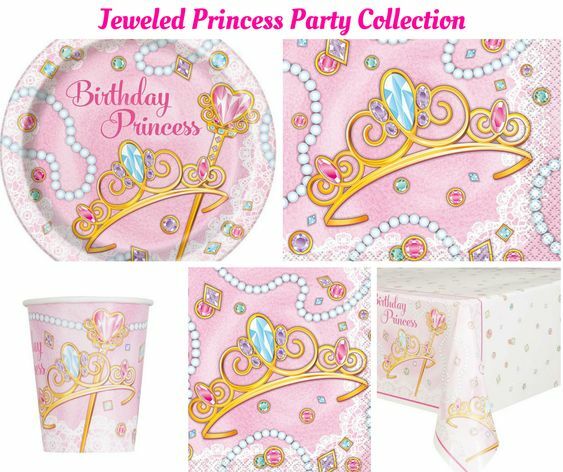 The cover is made with either hot pink or light pink satin fabric with a gold sparkle princess crown in the center of it! It is topped off with fluffy feathers across the top! 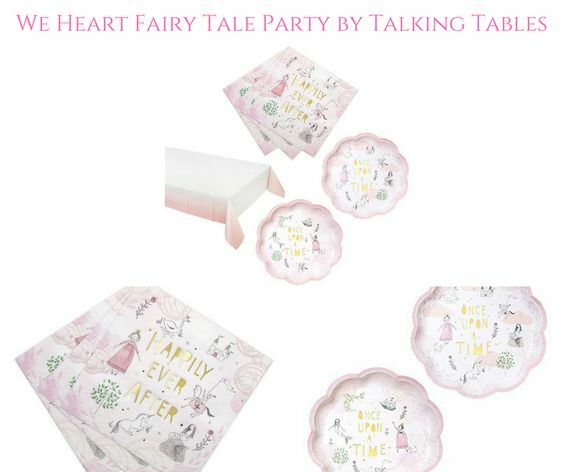 Listing price is for a 36″ Tray (which should cover standard high chair trays). Length is 24″ L inches in picture shown. I will make any size, just message me. Colors Used: Fuchsia and Purple Tulle. 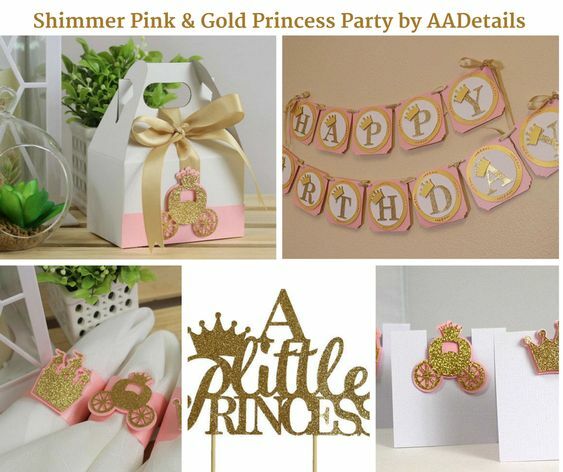 Glitter Gold and Purple or Pink Banner. 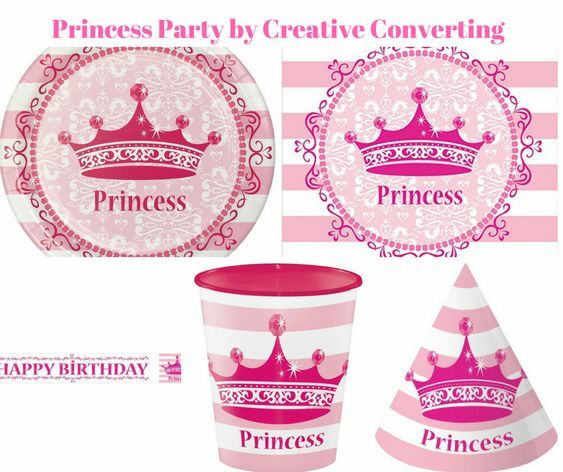 You can chose Gold or Silver and Purple or Pink for your Princess Crown Banner. Colors Used: Shock Pink, Pink and Light Pink. Length is 14″ L inches in picture shown. I will make any size, just message me. 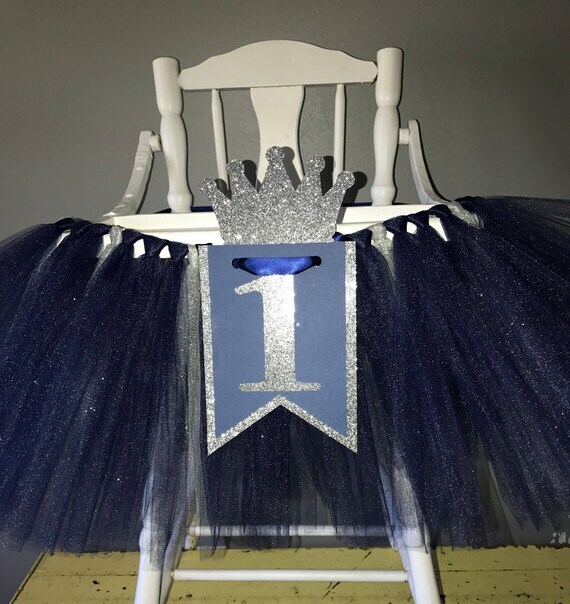 Navy and Silver High Chair Tutu, Princess Party Highchair Tutu, Navy and Silver First Birthday, High Chair Skirt, You chose the colors! Length is 12″ L inches in picture shown. I will make any size, just message me. 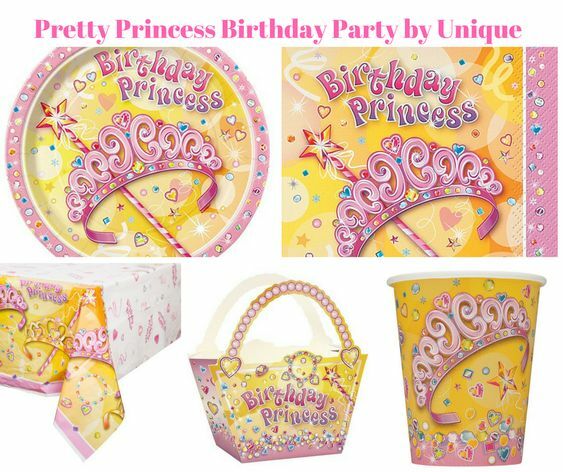 Banner features a tutu with a mix of gold and pink shades, sparkle, and a princess tiara. Top of tutu measures 25″ long, not accounting for fullness on the bottom (generally 38″ when fluffed). Not intended for wear. Centerpiece is made of card stock. **Tutu is made with a mix of shimmer and glitter tulle. It is possible, as with all things designed with glitter, for it to rub off when handled. While this will not be excessive enough to change the overall look, it is important to note incase you are worried about a little bit of sparkle on floors, hands, clothes etc. 😉 Handle with care. 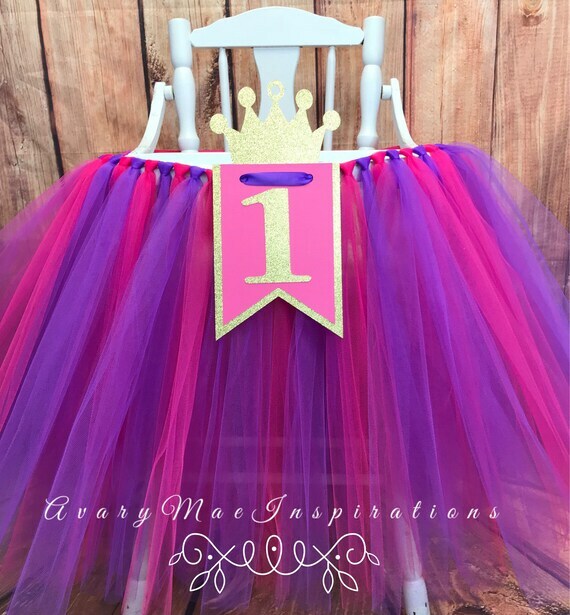 The tutu in the picture is about 34″ wide and about 12″ tall. The tutu is made out of pink and glittery silver tulle attached to a ribbon. There are a few velcro circles inside for easy attaching. 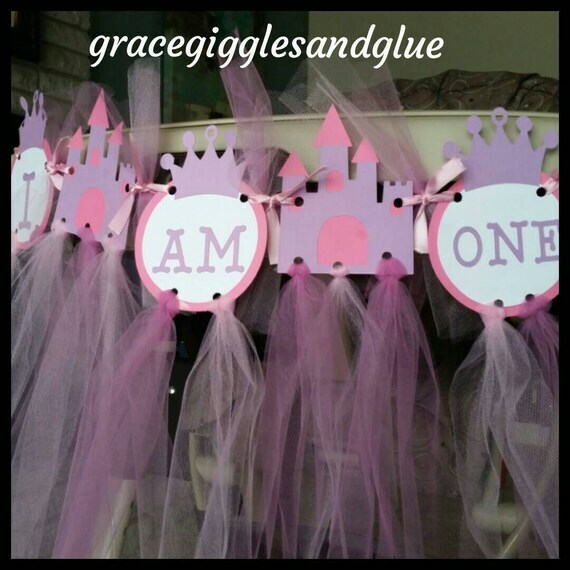 The ONE banner with a crown is about 5″ tall and can come in any number. 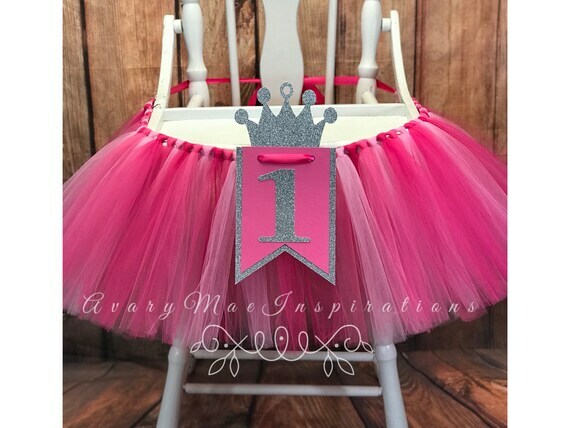 Make your little one’s birthday extra sparkly with this adorable highchair tutu! 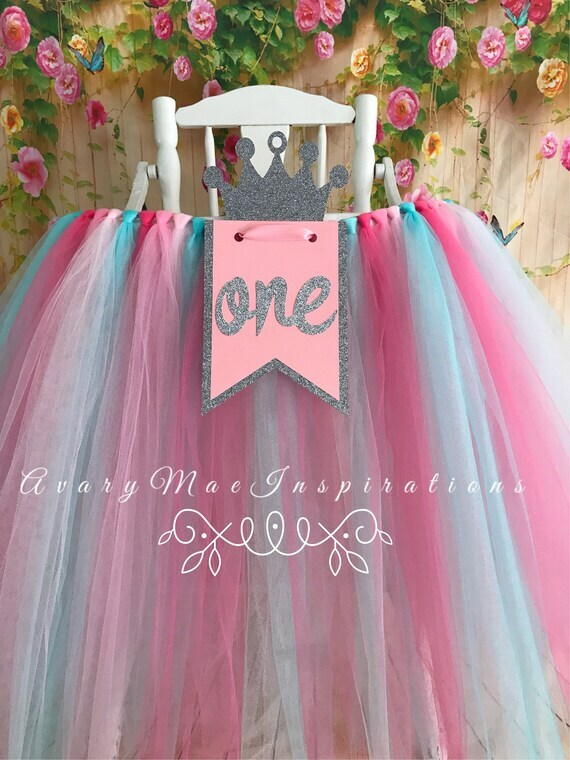 The tutu in the picture is about 34″ wide and about 12″ tall. The tutu is made out of pi!nk and glittery gold tulle attached to a ribbon. There are a few velcro circles inside for easy attaching. 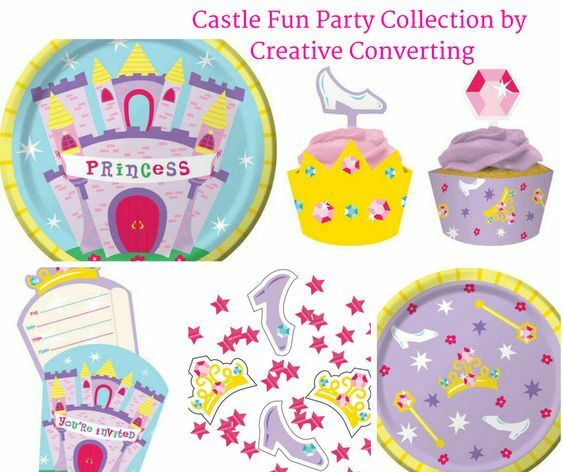 The number circle with a crown is about 5″ tall and can come in any number. Please note that glitter tulle may shed some! I use the highest quality tulle available but it still may shed a bit. 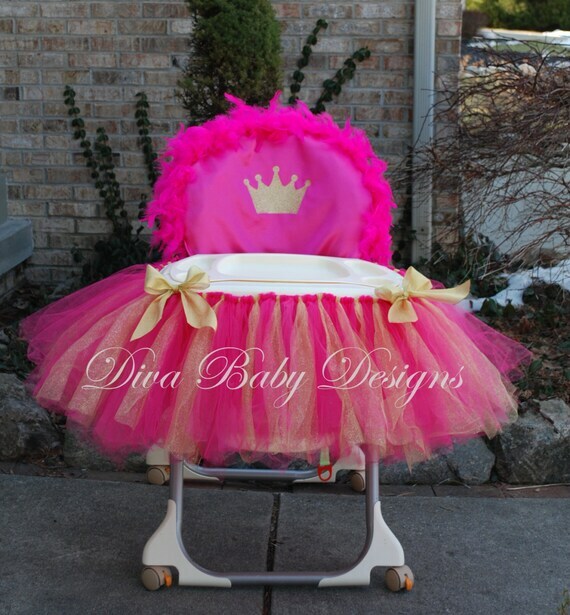 Our high chair tutu is super cute for any little one’s birthday party! Fits standard high chair trays. 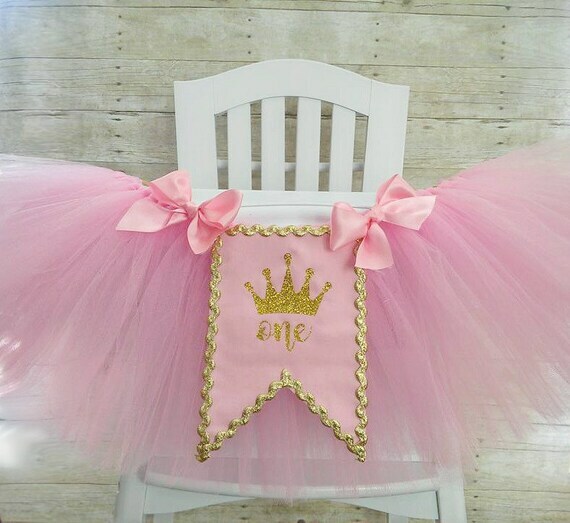 Made with pink tulle and a crown one banner. 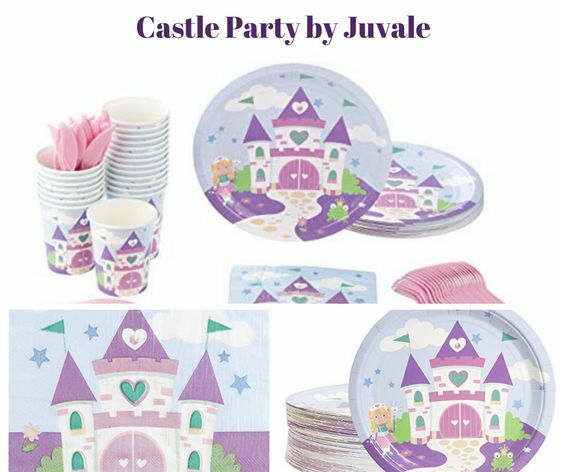 Can be made in any color to fit with your child’s party theme! 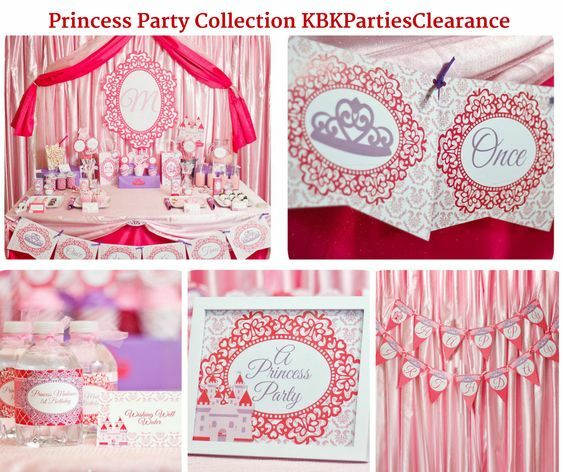 Made with pink tulle and a silver crown one banner. 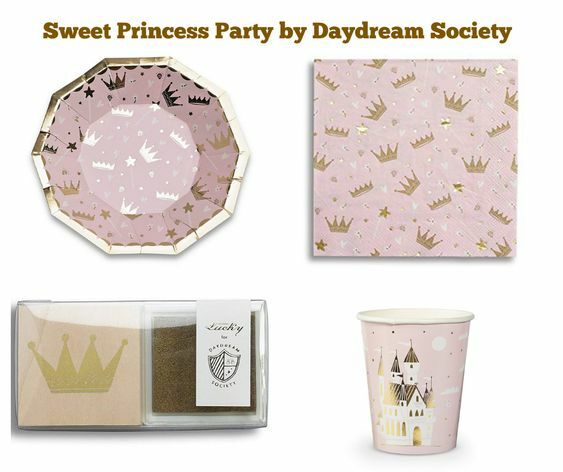 Colors used: Light Pink and Shimmer Gold. Length can be made longer or shorter, just message me. Length in picture is a 14″ Tutu. 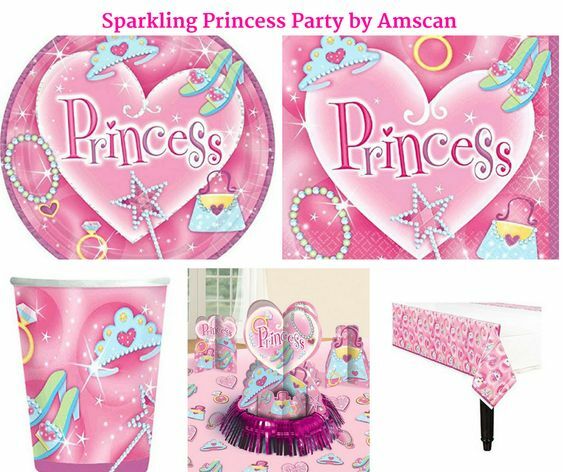 This listing is for a princess themed “I AM (Age)” highchair banner. 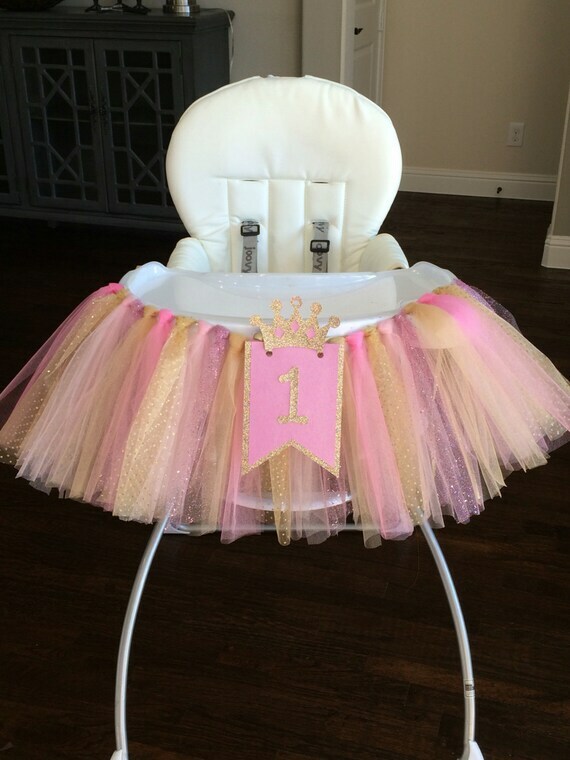 Banners fits all standard high chairs and comes embellished with pink and purple tulle. Different colors are available as well so please contact if you have a different color preference. 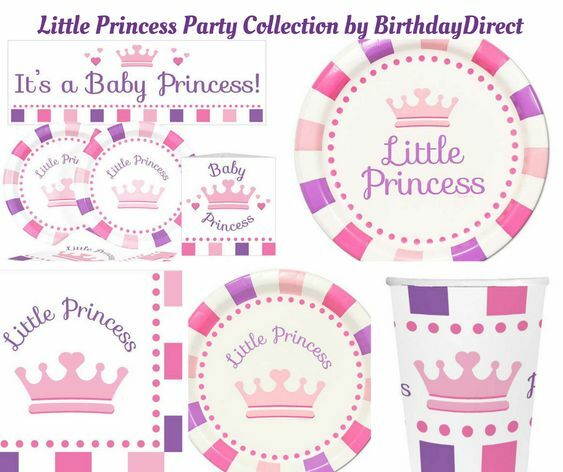 Please be sure to look in my shop for the matching cupcake toppers, cups, banners and more! 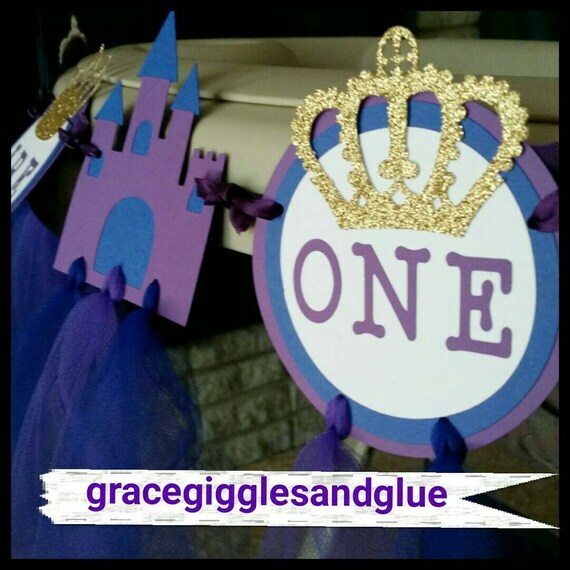 This listing is for a princess/prince themed Glitter Crowned “I AM (Age)” highchair banner. 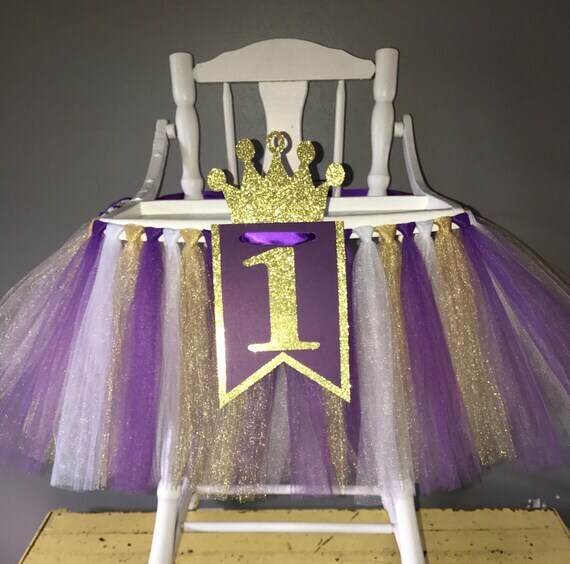 Banners fits all standard high chairs and comes embellished with royal blue and purple tulle. Different colors are available as well so please contact if you have a different color preference. One of the most special photos in your child’s life is tearing into their first cake! 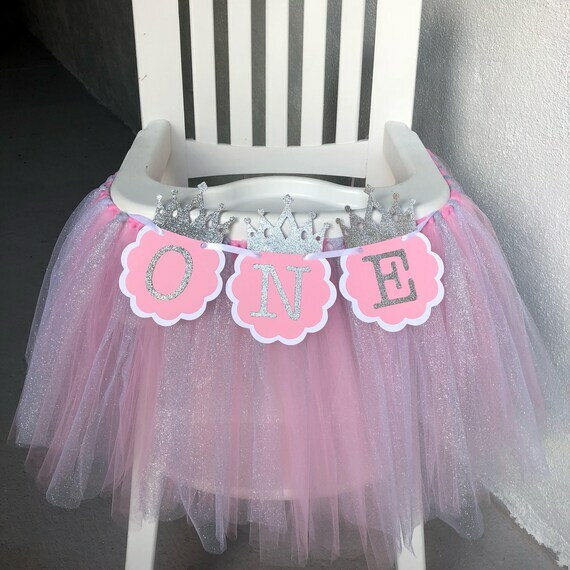 Imagine your loved one sitting behind this gorgeous creation for their 1st birthday party while digging into their yummy cake! This beautiful tutu is so festive! 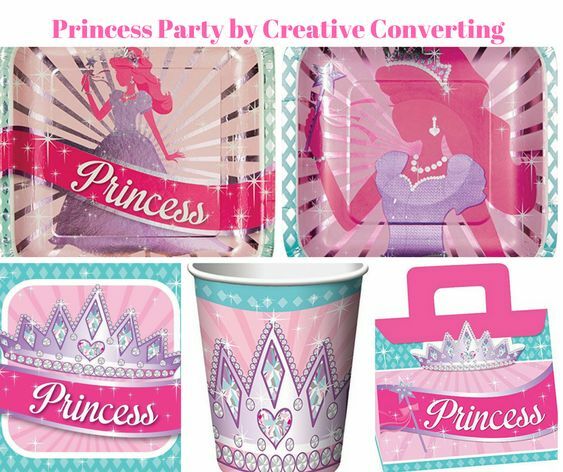 Made with tulle underneath and pink and silver fabrics with different ribbons hanging down and a crown banner in glitter vinyl. 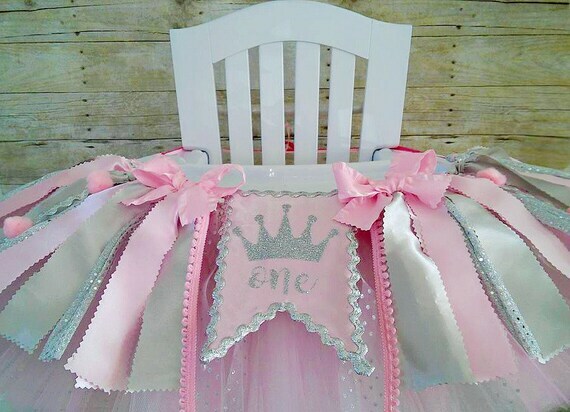 All of our high chair tutus/banners come with hook and loop fasteners attached so you can easily attach it to your high chair. 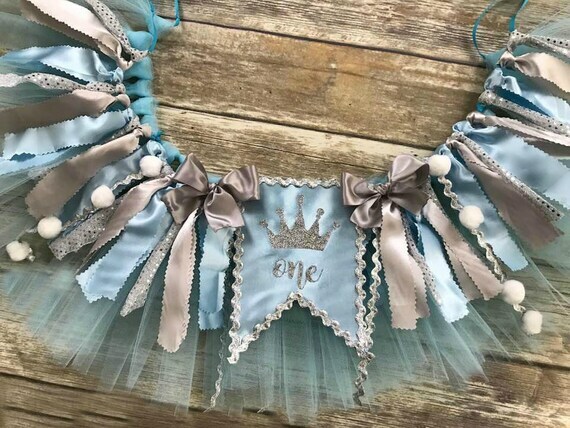 Made with tulle underneath and blue and silver fabrics with different ribbons hanging down and a crown banner in glitter vinyl. 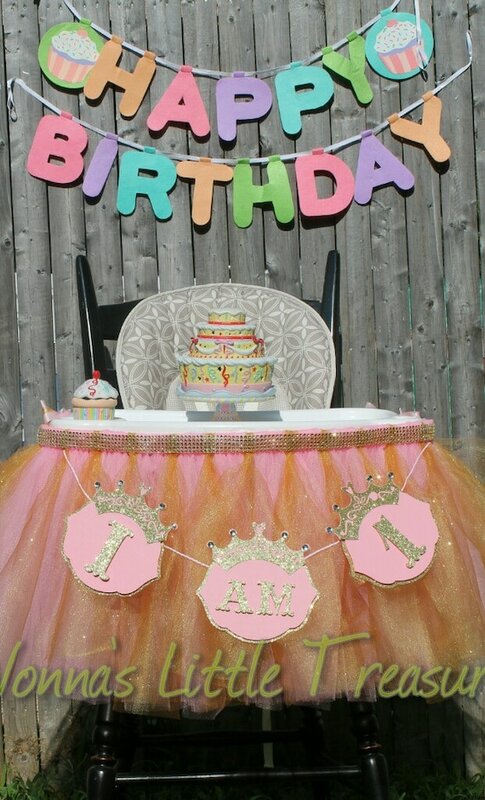 Princess High Chair Tutu With “I AM 1″ banner, has yards and yards of premium pink tulle. The Bling around the whole width of this tutu is sure to catch some admirers. There are 3 Gold Glitter bows, 1 on each end and 1 in the middle. All 3 are decorated with bling. 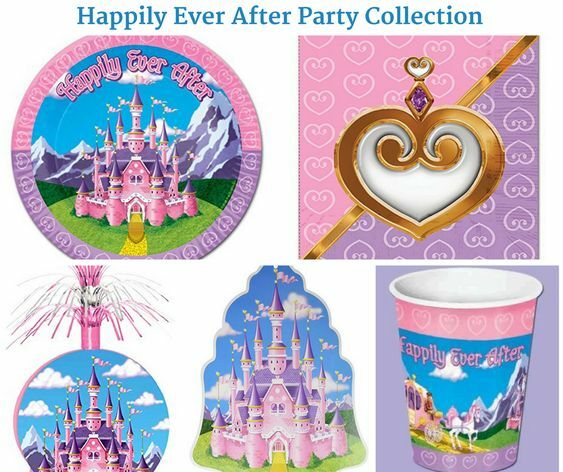 There is also bling through out the entire skirt for added sparkle for an all around picture perfect view. 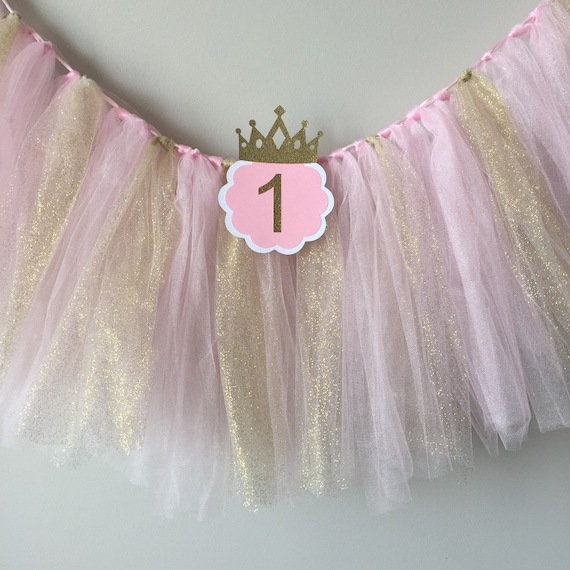 To top it off with an ” I AM 1 ” banner made with high quality pink card stock & gold glittered card stock. The banner has foam squares to give it dimension. Each pennant is 6.5″x 6.5″, I & 1 are 3″, and the AM is 2″. Each Crown is adorned with rhinestones on the top. 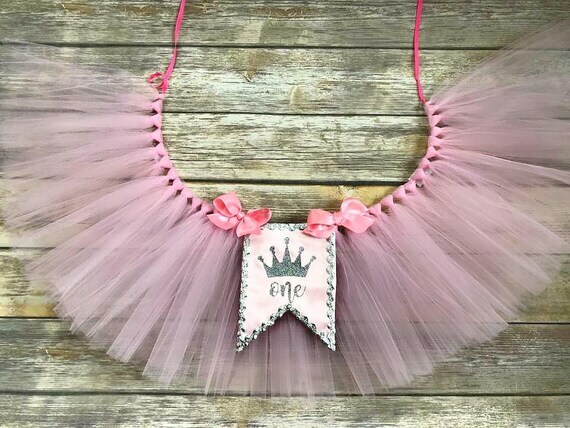 I used pink paper rope to connect it to the tutu skirt. 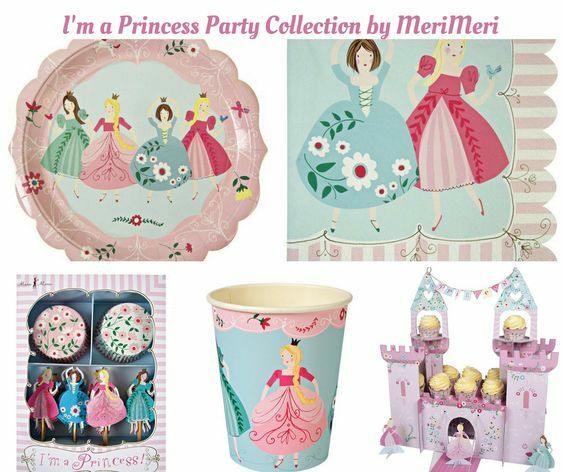 Great for your little princess or as a gift. 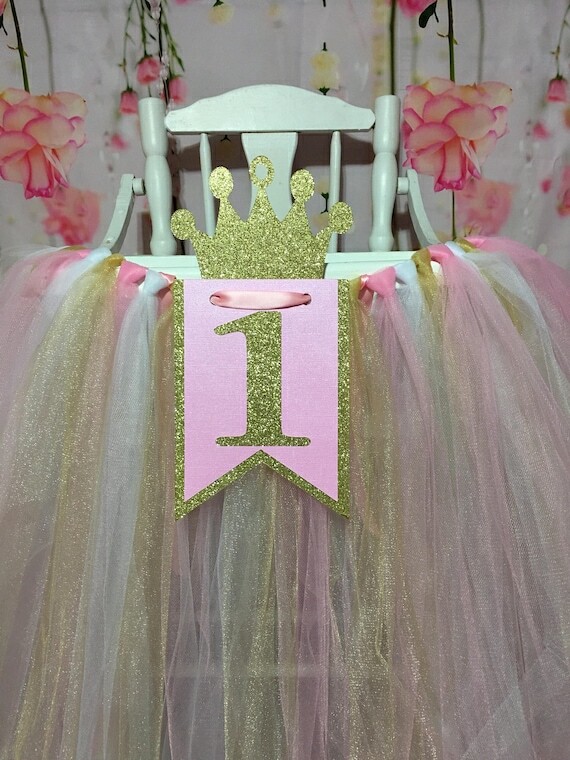 Pink & Gold Princess High Chair Tutu With I AM 1 Banner has yards and yards of premium pink & gold tulle. The gold tulle is glitter tulle. The gold bling around the whole width of this tutu is sure to catch some admirers. There are 2 pink and gold bows with bling on each end of the tutu. 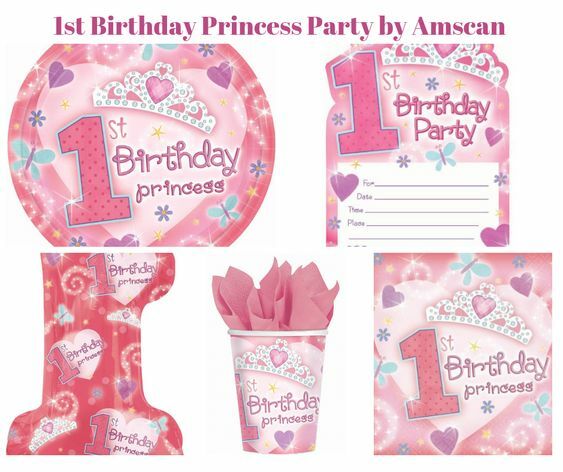 To top it off with an ” I AM 1 ” banner made with high quality pink card stock & gold glittered card stock. The banner has foam squares to give it dimension. Each pennant is 6.5″x 6.5″, I & 1 are 3″, and the AM is 2″. Each Crown is adorned with rhinestones on the top. I used pink paper rope to connect it to the tutu skirt. 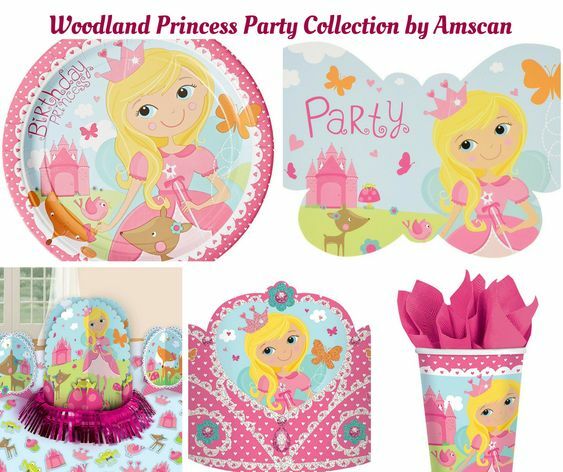 Great for your little princess or as a gift. 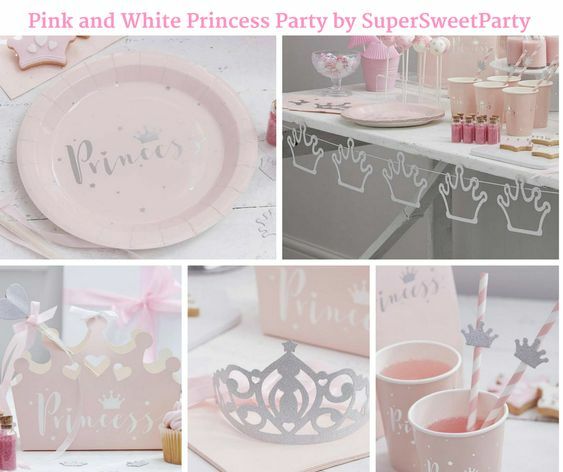 It will definitely dress up your little ones special day ! !